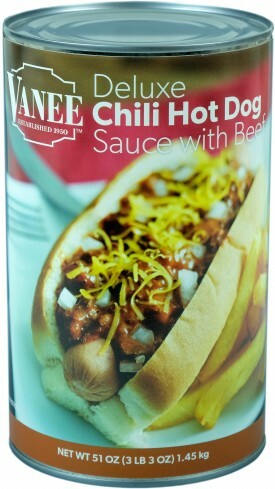 Vanee Deluxe Chili Hot Dog Sauce contains large chunks of ground beef, blended in a beanies, red pepper chili sauce. 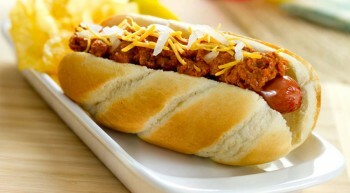 Great on chili dogs, fries, baked potatoes, and nachos. Vanee Deluxe Chili Hot Dog Sauce frees up valuable freezer space by being shelf-stable, has lower sodium than the national brands, is formulated to work with your chili pump, and is heat and serve for ultimate back-of-house simplicity. Each 51 oz. can has 24 quarter-cup servings, for 288 total servings in a case. Convection: Place covered prepared product into 300°F oven for 30–40 minutes until center reaches 165°F. Conventional: Place covered prepared product into 350°F oven for 60 minutes until center reaches 165°F. Microwave: Place prepared product into microwave safe covered container. Heat on high approximately 2–3 minutes per portion or until center reaches 165°F. Stove Top: Place uncovered prepared product over medium heat for 10–15 minutes or until center reaches 165°F, stirring occasionally to prevent scorching. Beef, Water, Tomatoes, Onions, Textured Soy Concentrate (Caramel Color added), Food Starch-Modified, Spices, Salt, Dehydrated Onion, Sugar, Dehydrated Red Pepper, Lecithin, Oleoresin Paprika.